The Moisture Meter instrument measures the moisture content of soil, indicating when it is time to water your plants. Three various zones are indicated on the top of the meter to indicate the level of moisture needed for various types of plants. 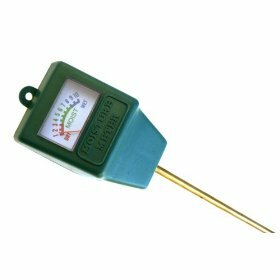 Moisture Sensor lets you know the humidity of your soil. The easy to read graduated dial indicates if the soil is dry, moist or wet so that a lawn or garden can be watered accordingly. Save water and save money with this durable conservation aid. Head / dial constructed of sturdy molded plastic. 8 inch metal stem for penetrating to root level. No batteries or electricity required. Instructions and watering tips printed on back of overleaf.